Vogue US has partnered with Apple to create an augmented reality-powered iPhone feature, available exclusively on the newly launched iPhone X on December 1. 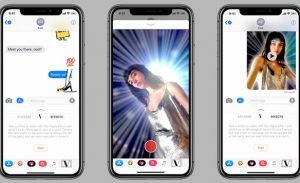 In a bid to merge the magazine’s trend-driven content with high-tech, “The Vogue Effect” iMessage extension uses the front-facing camera’s Face ID to create a multi-dimensional filter akin to those on Snapchat and Instagram. iPhone X users need to download Vogue’s app in order to access the filters, but they can be applied directly via iMessage once installed. The move comes as parent company Condé Nast looks to diversify its revenue streams in the face of declining print advertising revenue. Earlier this year, it partnered with Google to create a virtual reality video series taking viewers inside supermodel’s wardrobes, including that of Kendall Jenner and Cindy Crawford. It also launched its own Jean Jullien-illustrated iMessage stickers.